All types of fencing can be offered, if we don't list them this does not mean we can not do them. Close board panels, T.G.V. panels, Waney edge panels, Close board fencing, timber picket fencing (various top), Trellis, Chain link fencing, Concrete/timber posts, Hit and Miss (clad one side or both sides), concrete post and panel fencing Timber post and rail. 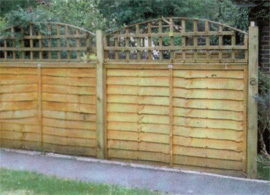 Various types and sizes of gates can be offered either to match the fencing required or to you requirements. All timber used is sourced from F.S.C supplies where possible and treated prior to installation generally pressure impregnated. © 2019 hillingdonfencing.com is the official website of Hillingdon Fencing Co. Ltd.